Provide comfort for the family of Richard K. Bates with a meaningful gesture of sympathy. 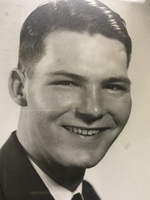 Richard Kenneth “Ken” Bates, age 88, went to join his heavenly Father, February 25, 2019. He lived his life to his fullest potential serving Jesus Christ, the Lord of his life for over 40 years. Richard Kenneth Bates was born August 18, 1930 in Ada, Oklahoma. He was the only child and son born to the late Kenneth Charles and Lucille Chism Bates. In 1936, they relocated to San Angelo, TX, where he grew up and was educated. In 1949 at the age of 19, he enlisted in the U.S. Marine Corp. He served his country with honor. Ken served in the Korean War, after which he re-enlisted, and was sent to Camp Pendleton. From there, he served in World War II in Japanese territory as a Staff Sargent for 16 years. Ken was flight pilot and instructor for 15 years. Upon returning home, he met and married the love of his life, Posy Beth Breighaupt. They were married for 38 years. Ken worked for Sears Department Stores for 10 years and joined Team PTL Ministries for 2 years leading Prayer Teams. When he moved to Waco, he was a Shriner, a member of the Optimist Club, the Gideons, as well as the Kiwanis. His heart and soul was doing the Lords will by giving and supporting missionary families overseas and watching those whose lives would be forever changed. He was preceded in death by his wife, Posey Beth Bates, a father, Kenneth Charles Bates, mother, Lucille and a daughter, Michele Rene Bates. He is survived by his service dog, Bailey Bates, who truly melted his heart and brought so much love and comfort. Ken had extended families and many friends who loved him. Ken was loved by all who knew him and will forever be in our hearts and on our minds. Pallbearers will include Davis Metz, Darrel Anderson, Jud Woodruff, Talmage Minter, Rick Lane and Greg Antunes. Honorary pallbearers: Band of Brothers and the Gray Eagle Pilots Breakfast Club, the Thursday Morning Men’s Prayer Group and John Watts. Funeral services will held at OakCrest Funeral Home, 4520 Bosque Blvd., Waco, TX. on Tuesday March 19th, 2019 at 10:00 a.m. A military graveside service will be held at Central Texas State Veteran’s Cemetery, 11463 State Highway 195, Killeen, TX. at 2 p.m. that day. In lieu of flowers, memorial donations may be sent to Rolling Hills Community Church, 1820 Columbia Ave., Suite 100, Franklin, TN. 37064, in memory of Richard Kenneth Bates, Waco, TX. To send flowers in memory of Richard K. Bates, please visit our Heartfelt Sympathies Store. We encourage you to share your most beloved memories of Richard K. here, so that the family and other loved ones can always see it. You can upload cherished photographs, or share your favorite stories, and can even comment on those shared by others. Provide comfort for the family of Richard K. Bates by sending flowers. It was truly a pleasure, Mr. Bates. There's nothing quite like the privilege of talking military history with someone who saw it in living color. I'm so glad we had the honor of adopting you into our family. My condolences to the Bates family during this difficult time. In the Bible, Jehovah God gives us hope. Acts 24:15 says, “there is going to be a resurrection of both the righteous and the unrighteous.” Revelation 21:4 says, “and he will wipe out every tear from their eyes and death will be no more.” Very soon we will see the fulfillment of these promises here on Earth. We hope you find comfort in God’s promises.